Analysis of club players’ games is the surest way to fix the mistakes that are made at this level and advance to master. Garry Kasparov always said it was Botvinnik’s advice on analyzing games that made him the player he was. However, if you want to progress much quicker, it helps to have a GM coach to point out all those problems and help you find the solutions. That’s what you get with this superb instructive 11 hour bundle “My Students’ Games” from GM Susan Polgar. Analysis of club players’ games is the surest way to fix the mistakes that are made at this level and advance to master. Garry Kasparov always said it was Botvinnik’s advice on analyzing games that made him the player he was. However, if you want to progress much quicker, it helps to have a GM coach to point out all those problems and help you find the solutions. 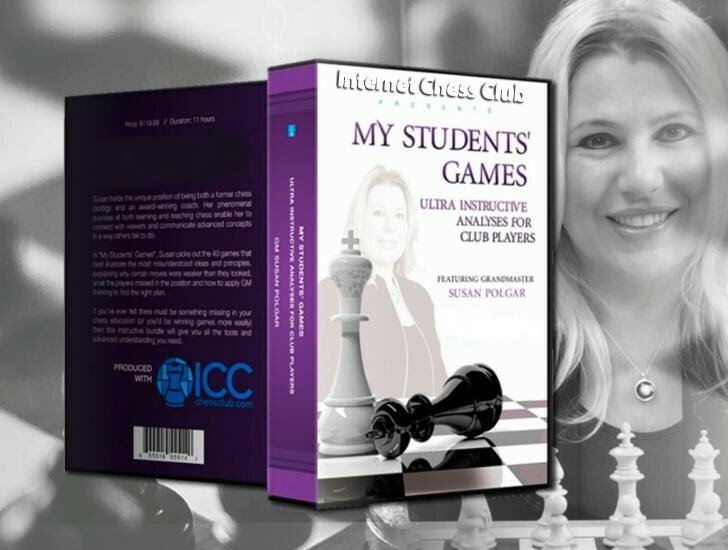 That’s what you get with this superb instructive 11 hour bundle “My Students’ Games” from GM Susan Polgar. Susan holds the unique position of being both a former chess prodigy and an award-winning coach. Her phenomenal success at both learning and teaching chess enable her to connect with viewers and communicate advanced concepts in a way others fail to do. In “My Students’ Games”, Susan picks out the 40 games that best illustrate the most misunderstood ideas and principles, explaining why certain moves were weaker than they looked, what the players missed in the position and how to apply GM thinking to find the right plan. Why 90% of club players stick to a pointless plan too long – and how to take advantage. The 2 factors you should guarantee before opening up the position. When it’s safe for the Queen to take on b2 in the Sicilian, and how to win the game when it’s not. How to play for an advantage when your opponent copies your moves and piece formation. How GMs think about tactics to find the winning line quickly. The secret to using Knights in the endgame. There is a huge amount of material in “My Students’ Games” and the 11 hours are filled with new ideas, skills and patterns for you to use to win your own games. If you’ve ever felt there must be something missing in your chess education (or you’d be winning games more easily) then this instructive bundle will give you all the tools and advanced understanding you need.